Michael Carroll hits out during Hopton Mills' Bradford League Championship Two game against Altofts last Saturday. Hartshead Moor strengthened their grip at the top of All Rounder Bradford League Championship Two after they dodged the showers and recorded a five-wicket win over Keighley last Saturday. 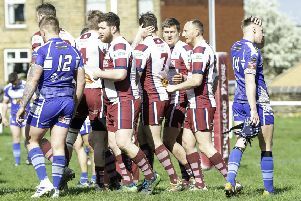 Hartshead stole a march on their rivals in one of only two games to see any play, with the matches involving Idle v Carlton, Hunslet Nelson v Brighouse, Northowram Fields v Liversedge and Spen Victoria v Buttershaw St Paul’s all abandoned. There were a few dark clouds to navigate around in a match reduced to 20 overs per side by rain. Iain Wardlaw maintained his impressive start to the season as he picked up 4-15 taking his tally to 20 wickets already. The former Scotland international was supported by Danny Squire (4-30) as Hartshead bowled out Keighley for 74 in 21 overs, with Travis Nightingale (21) the only Keighley batsman to reach the twenties. Hartshead Moor plunged to 27-5 in reply thanks largely to the efforts of Matthew Haines, who claimed 3-12 in an impressive four over blast. Hartshead have now won their opening five games and have opened up an 18-point lead over Northowram Fields and Buttershaw St Paul’s. The only other game to survive the weather saw Hopton Mills slipping to an eight-wicket defeat in a 20 over contest against Altofts. Ashley Mackereth top scored with 41, including four fours and two sixes but Hopton were restricted to 124-7 from their 20 overs. Luke Whitmore returned an impressive haul of 6-37 from his allotted six overs. Altofts lost an early wicket as Adam Parry fell to Bradfley Drake but the visitors recovered strongly as Kristian Miller made a fine 52 not out from 49 balls. He hit three sixes and four fours while the consistent Farrukh Alam struck four sixes and three fours in his unbeaten 48 as Altofts won with 15 balls to spare to move fifth in the table and leave Mills lying second-bottom.